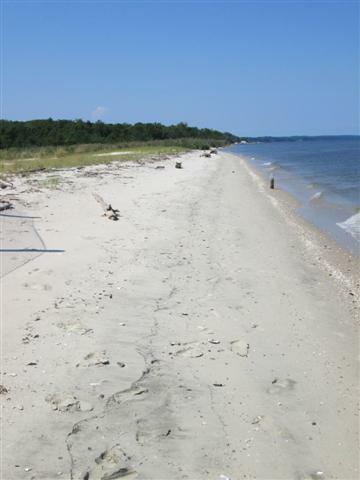 For hundreds of years the forces of nature have reshaped the Chesapeake Bay shoreline of Flag Ponds Nature Park, creating a remarkable variety of natural environments--from sandy beach, to freshwater ponds, to the forested heights of Calvert Cliffs. Today, nature continues to play with the sand, changing the park's landscape with each tide, each storm, each season. Millions of years ago, sharks, whales, crocodiles and other creatures inhabited the waters and shores of this area. Most of these animals are now extinct, others are just no longer found here. To the sharp-eyed visitor, sharks teeth and other Miocene fossils may be found along the park's shoreline. A short, half-mile hike brings you to the sandy beach or you may take longer trail routes that allow you to experience the beauty of the park. Additionally there are observation platforms at two ponds and on the Chesapeake Bay and a visitor's center with wildlife displays. From the early 1900's until 1955 the area was a sheltered harbor on the Chesapeake Bay supporting a major "pound net" fishery supplying croaker, trout and herring to markets as far away as Baltimore. At one time, three shanties housed fishermen during the main fishing season. Known as "Buoy Hotel", the last surviving shanty was destroyed by arson in October 2012. To make a reservation contact the State Department of Natural Resources Southern Region Public Hunting Permit and Reservation System online or by phone at the Myrtle Grove office at 301-743-5161. Flag Ponds Nature Park is Chesapeake Bay Gateways Network partner. All groups of 30 or more must make advance reservations. Groups without a reservation will be turn away at the gate. Weekends: 9 a.m. - 8 p.m.
Closed Thanksgiving, Christmas Eve, Christmas and New Years Day. *Please note that the beach closes one half hour before the park closes. The entrance fee (or annual pass) is per vehicle. January-March: $5.00 in-county resident or non resident. November-December: $5.00 in-county resident or non resident. Annual Park Pass: $20 for in-county residents, $30 for non residents. Vehicle registration is required for annual pass holders. $10 for additional vehicle to same owner. We accept checks or cash only; exact change appreciated. We do not accept credit cards and there is not an ATM available. All groups of 30 or more must make advance reservations. Groups without a reservation will be turned away at the gate.